Rear Admiral Mark Hammond joined the Royal Australian Navy in 1986 as an electronics technician. He was commissioned as a naval officer in 1988 and is a graduate of the RAN Recruit School (1986); the Australian Defence Force Academy (1990); Australian Command and Staff College (2004); and the Centre for Defence Strategic Studies (2014). Rear Admiral Hammond completed seamanship and navigation training in various ships then volunteered for submarine service. Qualifying in Oberon class submarines in 1994, Hammond joined HMAS Collins as Navigating Officer in 1996 (during First of Class Trials), and was selected as Flag Lieutenant to the Chief of Navy. He subsequently completed the Principal Warfare Officer's Course and Submarine Warfare Course in 1998, and served as the commissioning Operations Officer in HMAS Waller. In 2001 Rear Admiral Hammond instructed the Submarine Warfare Officer Course and assumed duties as Executive Officer in HMAS Sheean. In 2003 Hammond completed the Netherlands Submarine Command Course (Perisher) and the US Navy’s Prospective Commanding Officer Course. Rear Admiral Hammond served as Staff Officer Future Concepts at Naval Headquarters in late 2003, and graduated from Command and Staff Course in 2004. Hammond then deployed on operations with the Royal Navy Submarine force, before assuming command of HMAS Farncomb and completing two years of demanding operations in the Indo Pacific region. Subsequent shore postings included Assistant Naval Attaché - Washington DC, USA; Director Future Submarines - Operational Requirements; Joint Exercise Director (J75) at Joint Operations Command; Director Submarine Sub-Program (Collins and Future Submarines); and Chief of Staff to the Chief of the Defence Force, performing the latter role for General Hurley from November 2012 to December 2013. 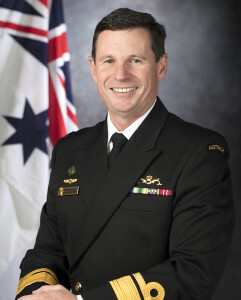 In late 2014 Rear Admiral Hammond was appointed as Director General Maritime Operations, exercising OPCON of the Navy’s ships, submarines and detachments, before relocating in 2017 to the United States for duties in the Pentagon as the Chief of Defence Force Liaison Officer to General Joseph Dunford, the Chairman of the US Joint Chiefs of Staff. Rear Admiral Hammond returned to Australia in March 2018 to assume duties as the Deputy Chief of Navy. Rear Admiral Hammond has sea experience in French, British and US nuclear attack submarines, Australian and Dutch conventional submarines, and multiple surface vessels. Academic qualifications include Bachelor of Science (UNSW, ADFA, 1991); Masters in Management (Defence Studies, UCAN, 2004); and Masters in Maritime Studies (UoW, 2005).